Over half a century ago I was taken by my "Sigiriya and its significance: A Mahayana Theravada Buddhist monastery"by Raja de Silva. 168pp. 168 ill. Printed by Aitken Spence Printing (Pvt) Ltd. Published by Bibliotheque (Pvt) Ltd., 7, First Lane, Galpotta Road, Nawala. late father, a Lawyer and Politician, yet a keen member of the Royal Asiatic Society, to a lecture in the Museum Lecture Hall delivered by Dr. Senarat Paranavitana, the Archaeological Commissioner. It was entitled Sigiriya the abode of a God King. The lecture was well attended, but most who had come, had it seemed, came in the belief that the secrets of Sigiriya could scarcely be revealed. 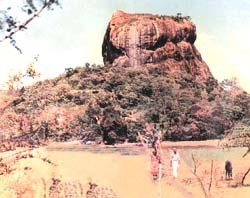 Some thought that the great rock was a fortress developed by a parricide king, fearful of revenge, since he had supplanted his heroic father, the liberator of the land from alien invaders and the benefactor of the vast agricultural population around the ancient and populous capital of Anuradhapura where thirsty fields had benefitted from the joining of the Kala and Balalu wewas into a gigantic lake which released waters through a unique irrigation marvel, the Yoda-ala nearly 50 miles long with a gradient of 1 in 600 ft. It was therefore a surprise to many present to hear that Kasyapa had abandoned ancient Anuradhapura, the nerve-centre of the land, and left to build a new capital in Sigiriya and to reside there. But Sigiriya was to be not merely a refuge and a fortress; it was also to exemplify a novel feature of the ruler as a celestial being, a "God King" like Kuvera. The concept of the deification of the monarch was held to be a growing and a new cult sweeping through Asia. 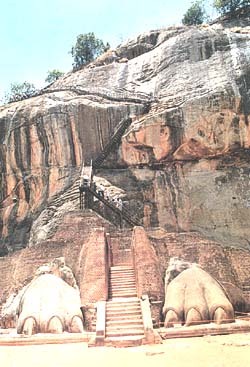 Sigiriya was conceived by Kasyapa. It was a plan to present himself as a ruler from on high in accordance with his concept that he, as a living God, resided on the summit of the massive rock. Dr. Paranavitana drew on his knowledge of Indian classical literature to find parallels that buttressed his theory, and proceeded to weave a magical tale of a celestial ruler on high and its heavenly environs. The gorgeous paintings of which only a fragment remains, were only celestial maidens; the mirror wall a contrived structure that reflected the red arsenic fields of the God Kuveras kingdom, and the Lion, before the final ascent, part of the plain where the fierce lions gambolled. Some critics who dared to question Dr. Paranavitana were given short shrift. He did not deny that it was a belief held earlier that Sigiriya was a temple, but he was encouraged by the Mahavamsa reference written nearly six centuries after Kasyapa, to declare that Sigriya was more than a fortress; it was a vast construction planned to deify Kasyapa. Elsewhere, for example in Rome, the Emperor had six centuries earlier been deified following Egyptian and Persian traditions. Kasyapa in Sri Lanka did not, as elsewhere in Asia and the world, require a special effort to circulate in his subjects a belief in his deity. High on the 600 ft rock, buffeted by regular rains and incessant winds, the construction of a palace and appurtenant buildings would have given Kasyapa hardly any time during his reign to fulfil his ambition if he so conceived it. He might have been swept away and the "God King" metamorphosed into a "Cloud Messenger"
In any case the ledges cut as guard sites would have endangered military watchers and required replenishments of soldiers. Moreover, regular visits to his court below would have entailed painful descents and ascents and brought about rheumatism or gout on the monarch, who though a refugee needed contact with court and commoner to effectively rule the kingdom. That the capital on the rock was most unsuitable for permanent construction or continued living was not paid heed to. No wonder Lord Killearn (earlier in Egypt as Sir Miles Lampson during the last Great War) heaved and panted on a visit to Sigiriya during our own Independence celebrations "Damn fool of a King to have lived at that elevation". Nor was it suitable for defence strategy. As Chou-en-lai, one of the great leaders of Chinas historic Great March observed ¾ the defenders could have been starved out in 6 months. But Dr. Paranavitanas web of Fancies had to remain until percipient minds assailed his theories. Dr. P. E. P. Deraniyagala, Acting Archaeological Commissioner, as has been shown by Dr. Raja de Silva, pointed out that the paintings were spread out over a period of time ( and some date certainly from a time prior to Kasyapa. &127;De Silva has shown considerable examples of Mahayana-Theravada worship that arose in India to spread to Sri Lanka about the period of Sigiriyas development. Tara Devi, like Cybele, Diana, Ceres ( and in our own times, Mary ( all reflect a human urge to seek protective divine maternal care. 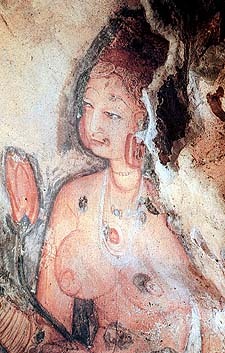 The worship of Tara, the iconography connected with her worship, and similarities to the Sigiriya paintings have been clearly shown by de Silva. That water and wells played a significant role in the Mahayana cult has also been shown by de Silva; so too, residences for monks on elevated land and on hills. 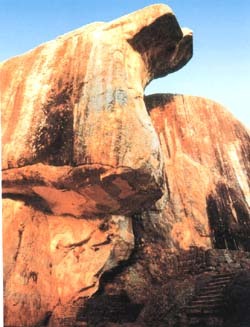 The Pacina-tissa-pabbata vihara below the Nuwara-wewa in Anuradhapura, the Giman-hala above the bund of Basavak-kulam, the summit of Alagalla, Wakirigala, the hill above Padavigampola, Kudumbigala, and other such sites testify to this. Sigiriya might have on some rare occasions given shelter to refugee soldiers. The safety of the shrine was resorted to in Europe and even in Sri Lanka after the 1818 rebellion, or refugee centers built at Nilambe in the Kandyan period or Govinda-hela centuries earlier. But to foist on Sigiriya a new capital that required obliteration of ancient shrines is to run in the face of fact and religious sensibilities. This has been clearly shown by de Silva. He has gathered much material as evidence from Sri Lanka and India and copious and relevant references to sites and traditions elsewhere to strengthen his work. In the field of art, especially painting, he has percipiently pointed out through Bertrand Russells comments how ancient Romans realized that not only what was visible to the eye but what excited the mind, made an impact on living humans. Verily this work of de Silva has dispelled doubts and vague conjectures on Sigiriya, and built up a coherent and cogent interpretation of this great centre, which never was "the abode of a God King", but for a long and significant period the resting place of a great and noble protectress of humans and a Mother of all Bodhisattvas. A deep study of all available evidence ( archaeological, literary, religious and cultural from Sri Lanka, India and further afield ( has made Raja de Silvas study a work of rare scholarship. He had first to clear the debris of misinterpretation, fanciful surmises, and ignorance of many, to get at the core that shows Sigiriya in its glory and Tara Devi in her protective effulgence.